Welcome back to the latest edition of Golden Nuggets, where I explore nifty tidbits about the Golden Age of comic books! Now, you may be paying this column a visit because there’s this crazy word up there in the title. It’s a big word for something nearly everyone has come in contact with at some point. Have you ever watched an episode of Looney Tunes, seen the Man in the Moon, or thought your stuffed animals had Toy Story adventures at night? Well, then you might have an idea by now. You’d be right if you guessed (or just plain knew Mr. Smarty Pants!) that anthropomorphism is the application of human characteristics to non-human things! Anthropomorphics have been around since before the birth of the comic book. Tales such as Alice’s Adventure in Wonderland and Wind in the Willows both employed these elements, in fact you could go back to Greek mythology or further if you’d like. But, before we go too far, I would like to to hone in on this concept being utilized in comic books. Why did it become so popular, and who is responsible? How did we go from Donald Duck to Donatello the bo staff wielding Teenage Mutant Ninja Turtle? Well, if you’re as curious as I am then have a gander at what I’ve learned! When most people think of animal characters their minds go immediately to probably the most famous creator of these sort, Walt Disney. The fame that Mickey Mouse and the rest of his cohorts garnered from cartoons translated easily onto the graphic page. Mickey has the distinguished honor of being one of if not the first “animal with personality” to grace the pages of a comic book. He and other characters graced newspapers in strips, but eventually the strips began reprinting in comic book format. Mickey Mouse Magazine began printing issues in 1935 and well into the Golden Age, which officially started in 1938. More notable is the long running series Walt Disney’s Comics and Stories, which started printing in 1940 and is still in print today! Many may not be aware of the writing, art, and world building of the late great Walt Kelly. 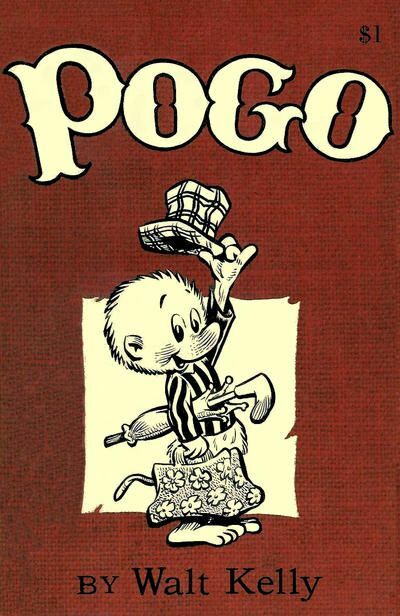 One of his most notable creations, Pogo Possum, got his start in Animal Comics #1 in 1944. As the years went by Kelly built a world full of human/animal hybrid characters. Before going fully into animal characters Kelly did have some dabbling in humans, but overtime phased them out giving the reason, “…you can do more with animals. They don’t hurt as easily and it’s possible to make them more believable in an exaggerated pose.” I like what Walt said, and I think he’s right. Yes, they are comic books and everything is exaggerated, but at the same time do we not draw more comparisons to our “human” superhero books since they often base themselves loosely in our universe? I think it’s easier to let go of the issues we might see in something being “realistic” as a reader when right off we have a talking alligator sipping a cup of tea. With that, our minds might readily accept the fantasy world we are diving into and may more fully enjoy it without the extra effort to break down our realist expectations. This one’s for all of you Marvel Family fans out there! How many readers out there knew that Captain Marvel’s powers were endowed to Hoppy the bunny? Well folks, it happened. 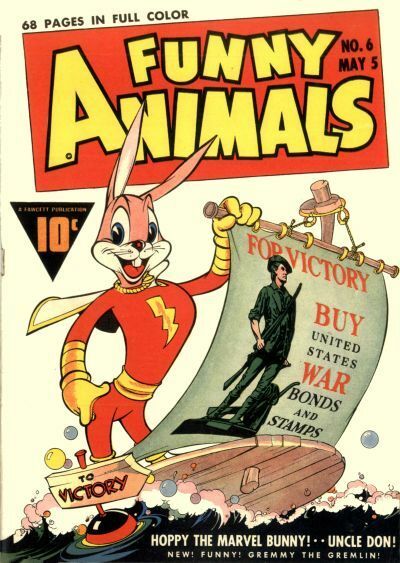 Soon after his debut in Fawcett’s Funny Animals #1 (1942), other animal characters such as Mighty Mouse (1946) and Krypto the Super-Dog (1955) started following suit getting powers of their own as well. I couldn’t find a definitive on whether Hoppy was the first amalgam of animal and hero, but he may have helped usher in that age! Thanks to the likes of characters similar to Hoppy and Mighty Mouse we began to see an increase in hero/animal characters as time has gone on. Now we have a whole slew of popular characters including Captain Carrot and His Amazing Zoo Crew, Teenage Mutant Ninja Turtles, Usagi Yojimbo, and Sonic the Hedgehog. Most of these characters have all enjoyed successful comic book runs for several years now. Anthropomorphic characters have also taken on more serious roles in books like the more recent title Mouse Guard or mature themed Omaha the Cat Dancer and Albedo from the 1980’s. So, how about you? Does anyone else have any favorite animal characters they’d like to share? I’m curious about other super powered anthropomorphic characters from the Golden Age I haven’t mentioned! Can anyone think of any non-animal anthropoids? Please chime in down below in the comment section! If you are interested in reading these or other classic Golden Age books I’ve mentioned then go here. Even further back than hellenistic mythology, or egyptian for that matter, many aboriginal myths contain heavy doses of anthropomorphism. Spirit animal guides for instance. It seems anthropomorphism is something inherent to all cultures. Agreed! I suppose it’s only natural that these characters exist. They were popular even before someone decided to put it in a comic book. I think it’s safe to say that TMNT has had the most success starting off as a comic book. I know Walt Disney characters are at another level, but they came first through other media. It is 2014. It is the year of Guardian of the Galaxy. This article about anthropomorphism exists pretty much because of Rocket Raccoon. Yet it seems like you went to extremes to avoid mentioning him. Sad.